Some of you may have noticed that it’s been a while since I reported on my income and traffic levels here on Side Income Blogging. No valid excuses, other than I just didn’t think about it. But, good news: For 2013 I’ve decided to make it a habit to start doing this again. I think it’s important for me to share my income and traffic. After all, I’m teaching you you how to start and grow a blog – I need to be transparent with mine blog. 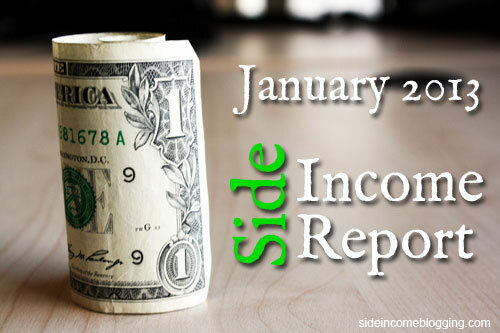 The last side income report I shared was in August of 2011 (yes, it’s been that long). That was when one of my top earning niche stores got hit hard by Panda and my revenue took a really hard hit. 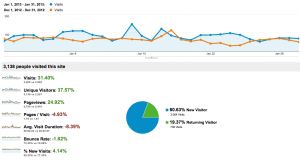 Frankly, on my niche sites, my revenue has continued to go down – but I’ve accepted that. Here on Side Income Blogging I haven’t really started monetizing just yet. I do have some Adsense and affiliate offers here and there, but they aren’t huge money makers just yet. I have plans to release some “eProducts later this year which I hope will be my primary money makers, or at least that’s the plan. The majority of my curent online income comes from my blog design and development work. What I’m trying to say here is that you shouldn’t expect big numbers, as I’m still working to grow my traffic and build an audience. Once that’s done, and I start to montetize a little more, you’ll see bigger income numbers. Pages/Visit went down by 5% – Not a huge drop, but I’ll be keeping an eye on this. Bounce rate is down by 2% – I’m happy to see this, as decreasing bounce rate is something I’ve been working on. 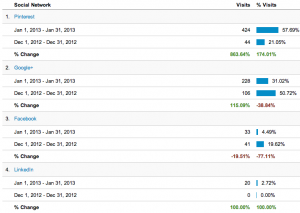 If none of this makes any sense to you, check out my Google Analytics series, it will help you understand the numbers. I had a few posts that became pretty popular on Pinterest, which ended up being my number social media referrer for January. Google+ is second. I’ve been trying hard to spend more time on both of these sites. 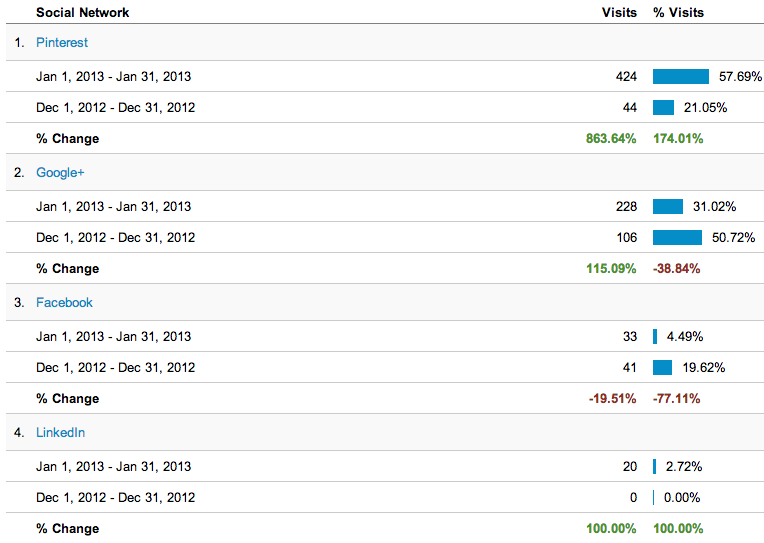 Given Pinterest traffic was up 863% and Google+ traffic was up 115%, I’d say my effort was time well spent. The best part? I really enjoy being active on both of these sites and in particular Google+. Again, I’m really not focused on income here on Side Income Blogging yet. My primary focus is building traffic and adding value add content. Once my traffic gets to a point where I feel I can begin earning a decent amount from advertising and products, I’ll do that. I’m just not there yet. I am running Adsense and have not reflected the earnings here as I didn’t reach the monthly $100.00 in January. I just hit it last night, so you’ll see Adsense earnings reflected on my February Side income report. I’m currently earning about $15 – $20 per month from Adsense across all of my sites, and $5 – $10 per month from Side Income Blogging alone. Small numbers, but we all have to start somewhere. Thanks for sharing your information. It’s encouraging to see the numbers and I am looking forward to seeing your success. I am just starting out and have watched Pat Flynn @ SPI income increase over the years. Hey Joel, I replied to you on Google+, but you’re most welcome. I look forward to seeing my success as well 😉 Pat Flynn is amazing, and I’m an avid reader of his site as well. He’s truly an example of what can be accomplished with hard work and focus. Inspiring post – you have approximately double the traffic I have and earn a few hundred per month from the site. I haven’t started to monetise yet (aiming to start this year) but seeing your income makes me think a successful start is possible! Thank you Steve – Success is absolutely possible, it just takes time. Unfortunately most people want to see a quick return, and when they don’t they quit. Thanks for being so transparent; it is so helpful to us beginners! I really love what you do and hope you go from success to success! Thank you Kim, I really appreciate your support! 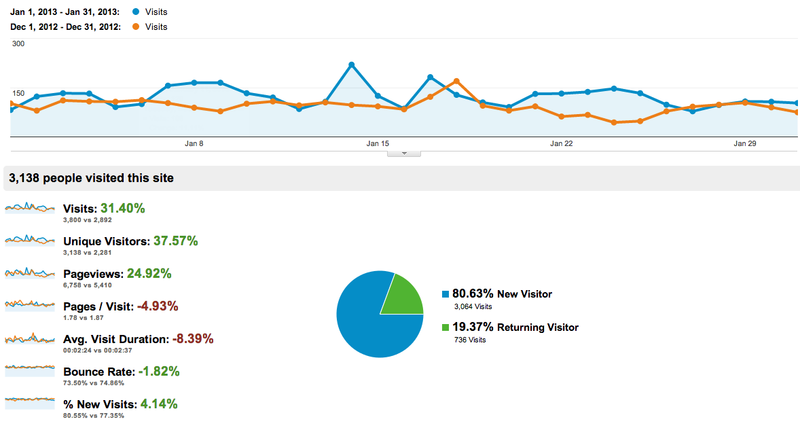 It’s kind of funny, but your traffic numbers are similar to mine. 6 (has it been 6?) years ago we were building our first baby sites at the same time, and now we find ourselves in the same position again. I hope this go around is as successful as the last! And thanks for all the tips. Now that I’m spending more time blogging again, I’m finding myself consulting Side Income Blogging frequently. Hey Lynnae, that is kind of funny. Honestly, given how long this blog has been online, I expected my traffic to be higher. I think growth is a little slower this go round. We were in a big growth period for blogs six years ago. I think growing a blog is a little harder now. Still feasible of course, just takes a little longer. Not to mention, the niche I’m in is pretty flooded. You’re most welcome for the tips and glad you’re finding the blog helpful. If I can ever help, you know where to find me. Let’s stay in touch. Working together before helping us both, and I don’t think this time will be any different. Really nice one month growth Larry. Glad to see you’re having success on Pinterest. Haven’t been able to get anything going myself there, but it’s a great opportunity. Thanks for sharing. Thank you Steven. I’ve been pleasantly surprised with Pinterest.